Le Creuset is thrilled to be introducing a brand new crisp shade of green to the culinary world with the arrival of Palm. A fresh and fun addition to the palette of classic hues from the makers of the world’s finest premium French cookware, Palm is inspired by the lush fringe of green that divides land and sea. Like the afternoon light casts layers on leafy palm fronds, the crisp botanical tones of Palm evoke the feeling of tropical relaxation by the sea. Perfect muse for coastal inspired recipes and fresh summer entertaining. Palm joins the iconic classics and the recent additions as Le Creuset’s newest colour, available this summer across the brand’s complete portfolio of quality enamelled cookware, bakeware, tableware, tools and accessories. The modern coastal inspired hue of Palm is available across Le Creuset’s complete portfolio of quality enamelled cast iron, stoneware and accessories priced from $12 to over $600. 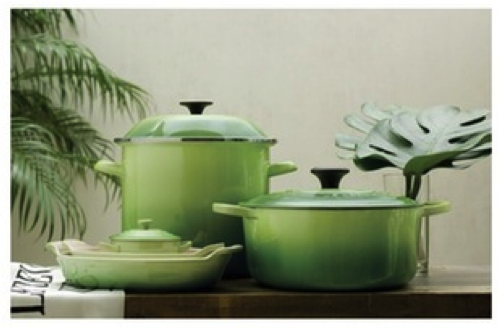 Available at Le Creuset boutiques and select fine kitchen stores across the country. Please visit www.LeCreuset.ca for more details.